I am thrilled to feature Shelly Figueroa here, as she has been a long time friend of Bolt’s! If you’re interested in finding out more about classes she offers, find her email contact here. Let’s get started, shall we? Shelly Figueroa has been sewing for the last 35 years and owns a successful children’s clothing pattern line “Figgy’s Patterns”. She is the author of “Sewing for Boys” and a contributing author of “Sewn Hats” craft sewing books sold worldwide. Locally she has been featured on FOX12 “Good Day Oregon”, KATU “AM Northwest” and most recently she was featured on the front page of The Living section in the Oregonian newspaper speaking out about the new generation of sewists, saving waste by creating by hand and sewing circles. You’ll find her work highlighted on the pages of sewing magazines and blogs around the world. Achieving this success has opened her eyes to what is in demand and need for our future generation of crafters and sewists. 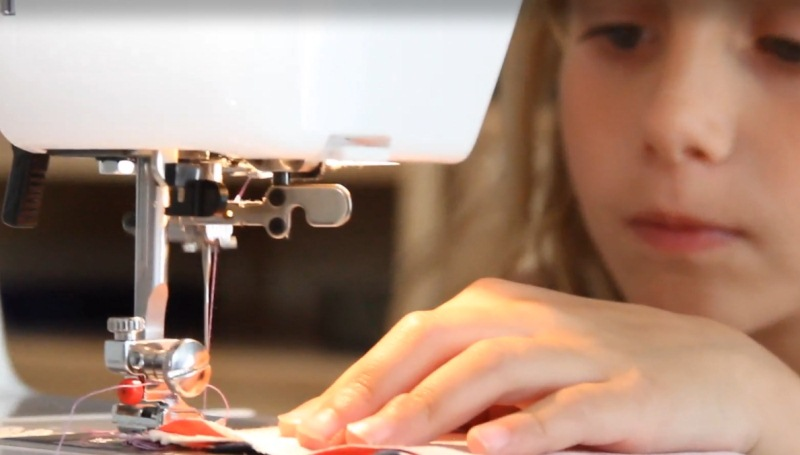 Figgy’s Studio is a sewing studio that offers up to date classes for the pre-school aged child learning how to hand stitch, the teens ready to design and sew his/her own clothing and now a few adult classes too. As the trends change as will the classes to keep classes fresh and fun. It is important to me that while learning an invaluable skill the class is still fun too! I love that students go home and tell their friends about what they’ve created with their own hands. We no longer have classes such as home-ec to show them how things are made and the importance of having these skills. We’d love to know a bit about your history as a sewist. Are you a life-long sewist or did you discover it as an adult? I’m one of the blessed, my mother had enough patience to teach me how to sew at the young age of 6. Prior to six she would give my sister and me fabric scraps, thread and needle to make barbie clothes. Mom is quite amazing. She also enrolled me in 4-H classes where I learned how to also crochet and knit. It wasn’t until my first son was born in 2003 that I started to design and my love of sewing kicked right back in. My path has taken some really cool twists and turns. Nine years ago I thought my career was creating a children’s clothing line but the more I learned about mass production the more turned off I was. For me there is no other way than handmade. So I dove right into creating clothes one at a time but struggled with finding patterns that allowed me to use their designs to make and sell. I decided I wanted to change that, so I took my first turn and began publishing my own designs. I wanted home sewers to have a pattern line to use which could help provide for their families. For extra income in my home I began teaching sewing classes at Bolt, Cool Cottons and then Modern Domestic and fell in love! So once again a new twist on my path called a career. Last year I was asked to teach a class in Denver CO for a company called Craftsy. That was a ball! And now you’ll find me in my home studio teaching kids of all ages every day but Sunday. For now I’m happy teaching and hosting workshops but there still might be more clothing pattern collections in my future. Tell us a bit about your latest pattern collection for Figgy’s Patterns. The last pattern collection for Figgy’s was Spring/Summer 2012. It was the second collection from “Figgy’s Patterns” since I re-branded and I began working with Daniela Caine. We wanted to offer patterns that are simple, modern and contemporary. Not all children’s clothes need to be just cutesy they can be fashion forward. Shot cotton, Double gauze and knits are my top three. I love comfort and for me these three are the most cozy. What trends in fabric or sewing have you excited? I love seeing sewists branch out into apparel fabrics. It’s been such a breath of fresh air to see people working with knits, wool, pique etc.. It seemed that people were stuck on using quilting cottons for all their sewing needs either because they were nervous or didn’t realize. I love seeing all the wonderful tutorials pushing for apparel fabrics. I’ve also loved seeing all the new organic lines popping up! In the pattern world I’ve been digging through old “Stretch and Sew” patterns of my mothers from the 70’s and loving it! I think this year is the year I’m making my own swimsuit. Wish me luck! I am putting the binding on a quilt! I’m really excited about this because this quilt was designed and sewn by the 3/4 grade at Hallinan Elementary. I was in charge of their Art Auction Classroom Art this year and we decided to make a quilt. I wanted the quilt to be contemporary so I used all shades of grey and a touch of polka dots. The kids and I decided to use “stacked books” as our inspiration block. I pieced together strips and each child in the class designed and sewed their own block. I put the blocks together/ quilted and now am binding this gorgeous art. This is so sad but I barely have time to leave my house to grocery shop these days but if I did…..I would visit NOUN to shop their latest and greatest. I’m a huge fan of places on Alberta Street, so I would have a bite at the Cruz Room (YUM) and visit Greenbean Books. Oh, and I would have to stop at Salt and Straw before heading home. A million thanks to Shelly for taking the time to share with all of us! You can find her sewing patterns for children’s clothing and her book, Sewing for Boys at the store. We’ve also been the lucky, lucky recipients of some of Shelly’s own samples for some of her sewing patterns. Thank you Shelly, you’re the best! Surprise! Sale day this Saturday!